David Burchett driver of the 77b Sprint Car, is 55 years old and for the past 24 years he has called Tracy, California home. He and his wife will be Celebrating their 31st anniversary this year. Theresa and David have two children Ben 28 and married to Mandy and Abbi 25. David currently works at CWE as a Service Delivery Manager working out of Modesto. David also can be found serving on Sundays at Grace Church in Tracy as a Service Director. Growing up in southern California David never thought we would be a Race Car Driver, especially not one who holds two Championships and three records. He still enjoys building and racing after over 24 years. David has always said “There is nothing like the incredible focus in a race, you can’t think of anything else just the next corner and the car alongside of you”. 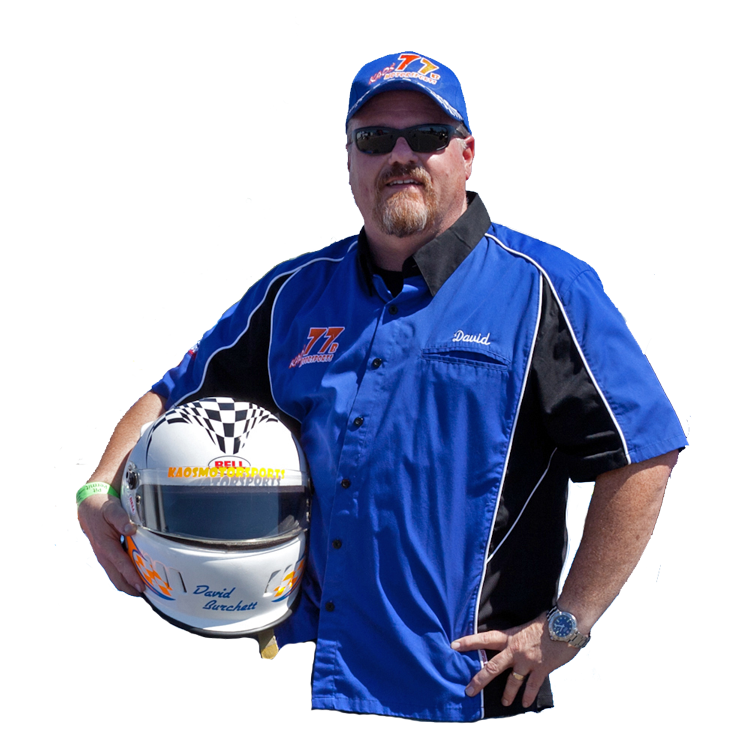 David started his love of racing years ago, from the arm chair and the sofa, watching F1 and Indy Racing. Some of the best racing was on Sundays, NASCAR was just getting big and Bill Elliott was showing the way to the front. David’s crew for the 2019 season leads off with his dad Warren Burchett with Dwight Cull and his son Ben Burchett taken on the crew duties that made the difference between just racing and having a shot at winning. When David is not racing, you will find him at Church or working on his sprint car. "Racing has become a full time job when you look at the time it takes to get ready for race day." After David finishes racing on Saturday nights, you can find him in the stands - he loves to watch the other divisions' race. It's always been about the engines for Warren Burchett, father to David Burchett and part of the sprint car crew. Warren's tinkering on cars in high school progressed to electrical work on locomotives for the Santa Fe rail road, staying with huge motors, he went on to work for California steel. Currently he is finishing a frame off restoration of his 58 Corvette, the car that coughs his eye in high school. The 58 Corvette will join his frame up 1964 Ford GT 40 currently waxed and waiting in the garage. Warren is retired but enjoys keeping busy finding ways to make the sprint car run faster. It helps that he has a passion for racing and a son who loves being a race car driver. A huge bonus for Warren is that he also gets to do crew work with his grandson, Ben. Warren and his wife, David's mom, Mary have been married 55 years. They moved to Tracy, CA in December of 2007. They love being near David and his family, and they're enjoying retirement in Tracy. It helps that the house they bought in Tracy has two garages! After all, it’s about those engines! Ben Burchett is in his first year as a University Professor of English Literature at William Jessup University in Rocklin. Ben and His wife Mandy enjoy living in the greater Sacramento Ca area. He has been a part of Kaosmotorsports since he was a little boy, but has only been a track contributor since his dad's rookie season in 2008 racing a Sprint Car. Due to Ben's busy schedule during the school year he has difficulty making it to some of the races that are further away, while the All American Speedway is in the backyard it is too far to commute to Madera CA. Ben really enjoys the racing atmosphere at the track, the noise and excitement fuel his passion for racing. Ben is considered the brawn of the team while Warren is the brain and David is the nut behind the wheel. Ben is responsible for operating the push vehicle, and setting the tire pressures, checking the tire temperature and helps out where he is needed. Ben has learned a lot from his experiences as part of Team Kaos and enjoys learning more and more with every race he crews at. Dwight is now a seasoned veteran of Sprint Car racing. He may be the newest member of the Kaosmotorsports team but he is an integral member and is enjoying his 4rd season of Sprint Car racing with the Kaosmotorsports team. Dwight is 39 years old and resides in Tracy Ca with his wife Liz of 13 years and two boys age 10 and 5 years old. The boys can be found at the Sprint Car shop with Dad and David most of the time working on something to go fast. Dwight and David met at Church, often serving alongside each other on Sundays.